Sony is following Nintendo’s smart holiday move by releasing a compact version of the original PlayStation, called PlayStation Classic. It’s a mini console with a collection of classic PlayStation games and two classic PlayStation controllers that you can buy for a hundred bucks. It’s a great gift for people that owned the original PlayStation and want to relive that era of gaming. Just like the Nintendo NES and SNES Classic, Sony’s PlayStation Classic features a pre-installed collection of popular game titles including Grand Theft Auto, Final Fantasy VII and Resident Evil. Check the full list below. 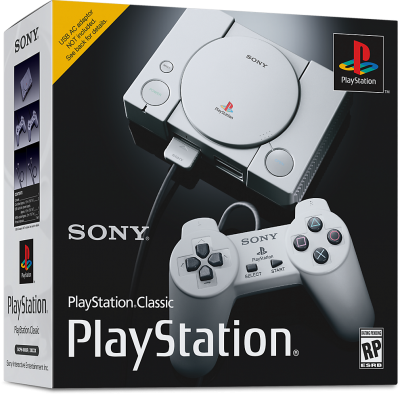 The PlayStation Classic will be released 3 December 2018 with all major retailers such as Amazon, Best Buy and Target. Seeing how the NES Classic release caused a huge demand and scarcity it would be a good choice to pre-order the PS Classic in time so you can be sure to put it under the Christmas tree.